Take an evening swim or sit and visit. Well manicured lawn and pool area to relax in. Grill and prep area for cooking outside. Outdoor dining in the shade. More living space if needed. Bedroom suite includes HD TV and desk. 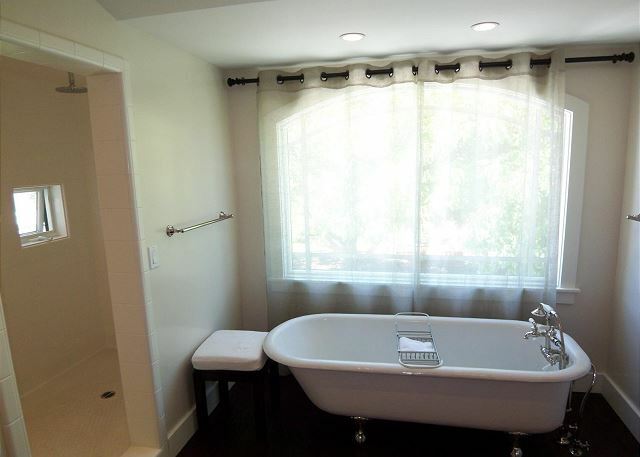 Take a long soak in the tub or enjoy a shower with overhead fixture. Bedroom above the garage w/ HD TV ensuite. Tertulia at Amber Ridge – where good friends and family gather in stunningly beautiful, peaceful surroundings to enjoy each other’s company over great food and wine. Deep relaxation, pleasant conversation, laughter and joy ensue! Tertulia is a fabulous two-acre Wine Country sanctuary surrounded on all sides by vineyards as far as the eye can see, with views of the foothills in the distance. The elegant main home is a 4br/3ba, nearly 4000 sq. ft., two-story, gated estate with central heat/AC, a spectacular gourmet kitchen, abundant high end architectural details and custom finishes, fine furnishings, and the entire home is floored in honed hickory hardwood made even more comfortable with the addition of beautiful area rugs. 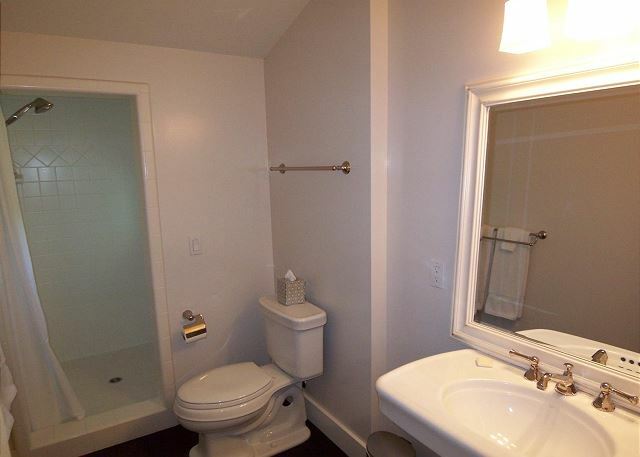 The accommodations can also include ($250/night w/ an additional $50 cleaning fee) a lovely, spacious 1br/1ba loft above the 3-car garage, with lovely attached bathroom below. 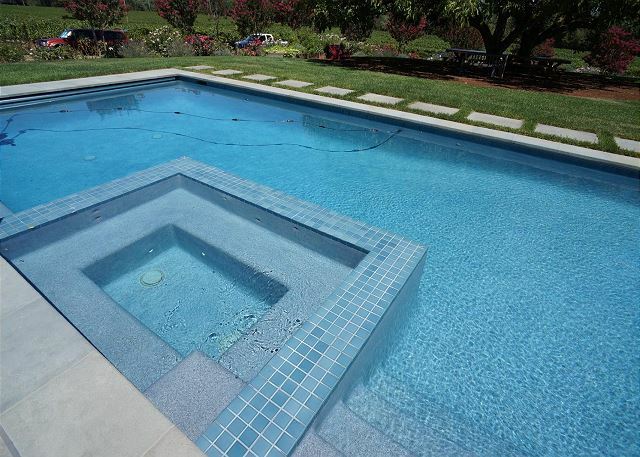 The extensively landscaped 2-acre grounds with in-ground pool and spa, outdoor kitchen, dramatic outdoor dining area and large gas firepit are surrounded by vineyards on all sides including those that produce a famed Kosta Browne Pinot Noir. 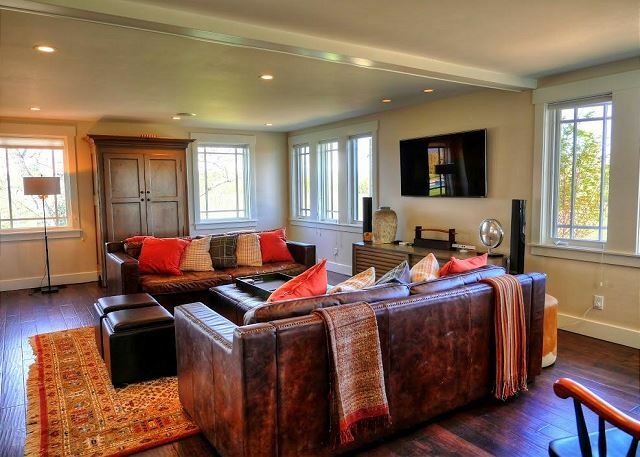 This beautifully appointed home offers the best of both worlds. Enjoy the spectacular setting of Tertulia as well as the fabulous dining, wine tasting, galleries, and shops of charming, historic, upscale Healdsburg - the “crown jewel” of Sonoma County’s Wine Country, only 5 miles to the north. 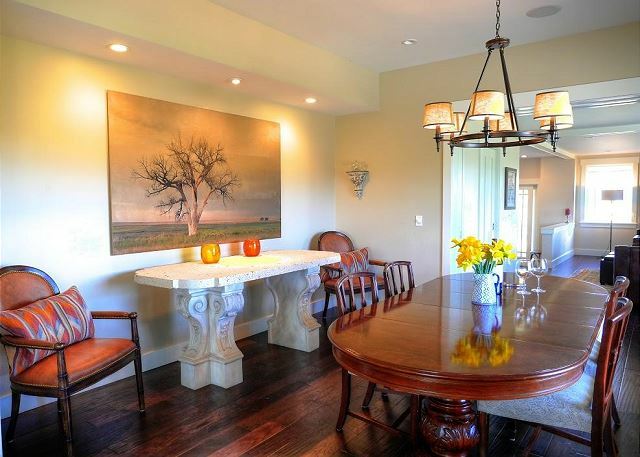 This very special home is located in the heart of Sonoma County- the “Tuscany” of Northern California - with Napa valley just over the hills to the east. Imagine awakening to the cool tranquility of an agrarian setting among the vines. 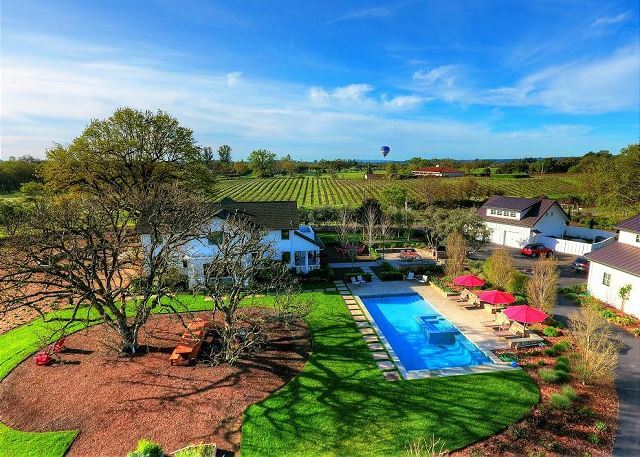 Enjoy your morning coffee or tea from a rocking chair on a shady porch overlooking luscious landscaping, manicured vineyards and the hills beyond as hot air balloons drift silently by overhead. Contemplate your day’s agenda – perhaps planning meals to make the best use of fresh offerings from Tertulia’s garden planters or a local farmer’s market, or maybe plotting your path to a winery or two before your coveted dinner reservation at a Healdsburg restaurant or a meal prepared by, or for, your group in the generous chef-friendly indoor and outdoor kitchens. When afternoon arrives, like clockwork, notice the afternoon breezes that clear the warm air before sunset. As evening falls slowly, gather on the patio to watch the sun fade along with the din of conversation. 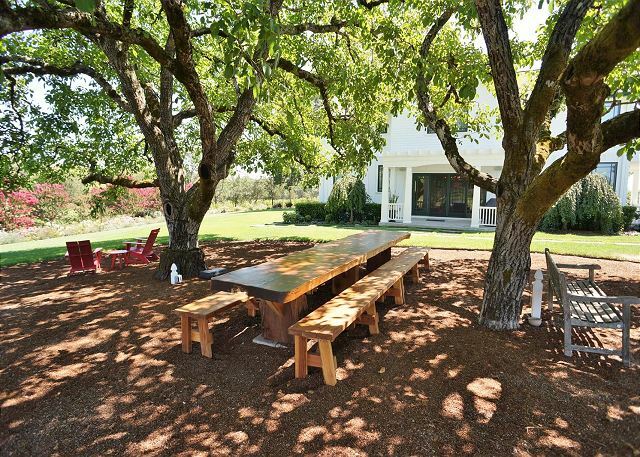 You might choose to dine al fresco at the majestic redwood slab table under the shelter of two ancient black walnut trees. And to end your day, unwind in the pool and spa as you gaze at the stars above – so bright in the dark night sky removed from the city lights. This is Tertulia at Amber Ridge. A 5-mile drive along the tree-lined back roads brings you across the quaint Veterans Memorial Bridge to charming and historic Healdsburg surrounded by the three famed wine growing regions, Dry Creek, Alexander, and Russian River Valleys. This wonderful and eclectic community recently celebrated its 150th anniversary and has grown from a tranquil agrarian center to a top travel destination featuring fine dining, art, and antique galleries, specialty shops, spas, and a variety of interesting activities concentrated around the mature redwood tree-lined, central Plaza with fountain and gazebo. The surrounding areas are also rich with opportunities for hiking, biking, golfing, fishing, canoeing, kayaking, ballooning and exploring the beautiful northern California coast and redwoods. With so much to do and so many things to see, you may want to extend your vacation plans for as long as you can, to take it all in and have a truly memorable and magical Healdsburg holiday. Our guests are also welcomed at Healdsburg’s premier Parkpoint Swim & Health Club with a heated lap pool, aqua aerobics pool, children’s pool, as well as all the workout equipment and exercise classes you can enjoy, and day passes are available for purchase. 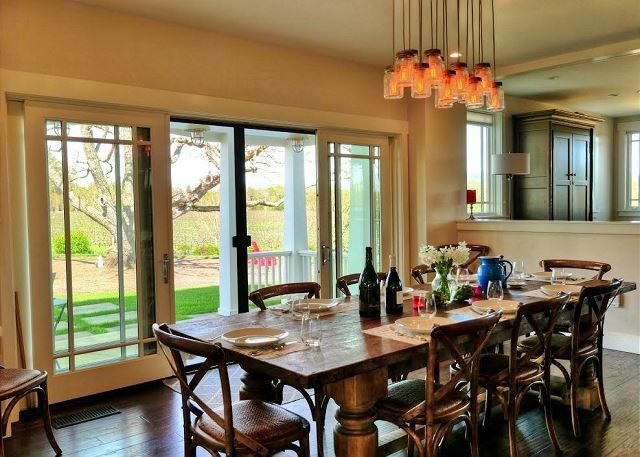 Four couples from Michigan flew to Sonoma for a few days of relaxation without kids. This location was incredibly serene, well maintained, and had everything you needed to enjoy the area. Don’t make plans to go out as you will not want to leave once you arrive. It worked well to visit a winery in the a.m., and one over lunch. We were back to the house around 2:00 each day to enjoy the space and cooked in with the wonderful chef’s kitchen. The property was just perfect for a 5 night stay. We also rented the loft and we had plenty of room for our family. The bocci ball court was very nice, as was the long redwood table that was large enough for all guests. Also, the tables and chairs by the BBQ gave us another outdoor area to eat. On one cold night we ate in the house and once again the table and chairs were suffficient for the entire group. Pool was fantastic. I could not believe from the pictures of the facility that the landscaping and surrounding vinelyards could be as beautiful as they appear. Actually they are much better. We are just amazed at the beauty of the landscaping on the property and the vineyards that surround them. Beautiful setting amongst the vineyards, very private yet close to town. A real effort has been made with the grounds and they are gorgeous. The double walnut tree canopy is a rare and beautiful feature. 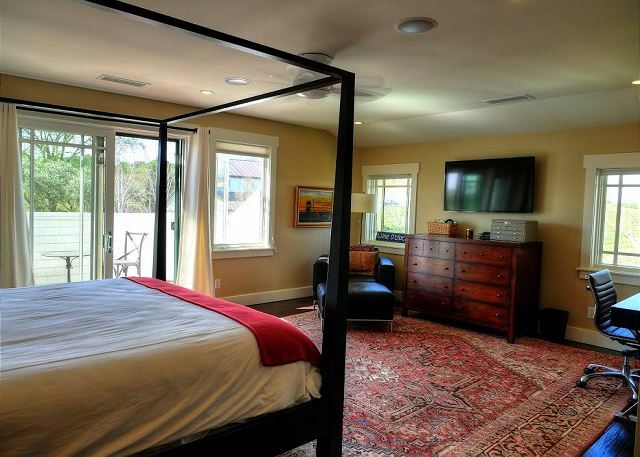 The house was spotless and while perhaps a bit formal, still reasonably comfortable. 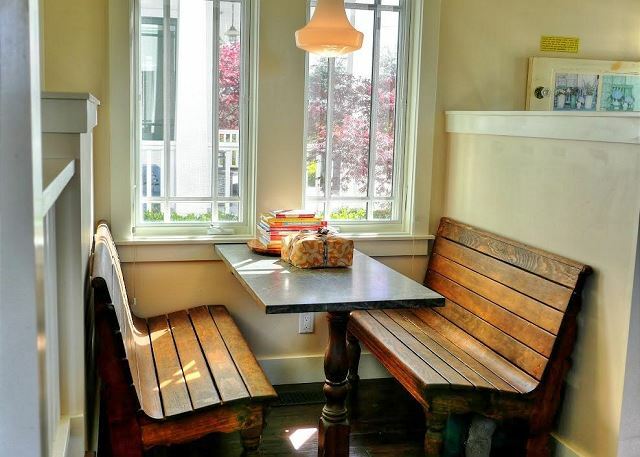 They could use a little nice furniture for the beautiful wrap-around porch deck. Gorgeous but totally absent anyplace to,sit and enjoy. Overall very worthwhile and would rent again. It was an amazing property and the responsiveness of the office was great. Other than attack of the wasps, this place is great. We have come to this same house the last 3 years and I hope to make it an annual tradition! Great home, highly recommended. The combination of location, amenities, and access to wineries in the area made for a great trip. home was very well maintained. The kitchen was a cooks dream. The property management company fell short in my opinion. The person that was supposed to meet us at the property on the day we arrived, did not show up until the following day. That day we had called the PM company because we could not get the heat or jets in the spa. They dispatched a handyman immeditably out to fix, but the lady who was supposed to check us in arrived at the same time and sent him away. not only did she not fix the spa, but somehow she turned off the pool cleaning system. We called two days later as the water was getting full of leaves and bugs with the pool sweep not working. Same gal came out and basically said sorry, nothing she could do about it. For a property this pricey, I would expect better service and response. Home is beautiful. It was clean and well maintained. Owner should change property management company.